are places that get very little rain each year-so little rain that most trees and plants cannot grow there. Some deserts will go for years without rain. They are difficult places to live in, and the few plants, animals, and people who live there have to be tough to survive. 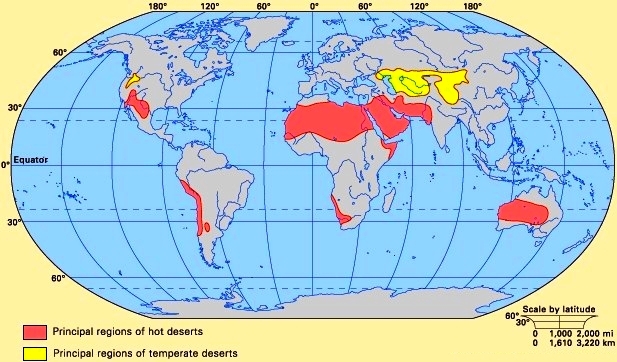 Every continent except Europe has a desert. Even Antarctica has one, a frigid desert. Most deserts, however, are arid, or dry, deserts with mile after mile of sand, baked earth, and barren rock. In the daytime these places look like lost worlds-hot, dry, and silent. Usually, the only plants growing there are low thorny ones. These plants store most of the water they are able to collect. It may be a long time before their next drink. At night it can be quite cold in the desert. That’s when creatures that have been hiding from the Sun’s burning rays come out of their homes. Many of the creatures are lizards and insects such as scorpions. There are also different kinds of rats as well as other, larger animals. You can hear the animals squeaking and growling near water holes and springs. That’s where the coyotes, badgers, bobcats, foxes, and birds gather, all hunting for food and water. When the rare spring does bubble up in the desert, plants and trees begin to grow. An island of green like this is called an “oasis.” Many people choose to live in the desert. In late afternoon the sky turns crimson and gold, and the mountains make purple shadows. And at night the stars seem close enough to touch. Deserts are areas in which there is a shortage of moisture available for plants. There is no precise measure of how dry such an area must be to be called a desert. Characteristically, deserts receive an average of less than 10 inches (25 centimeters) of rain or other precipitation per year. 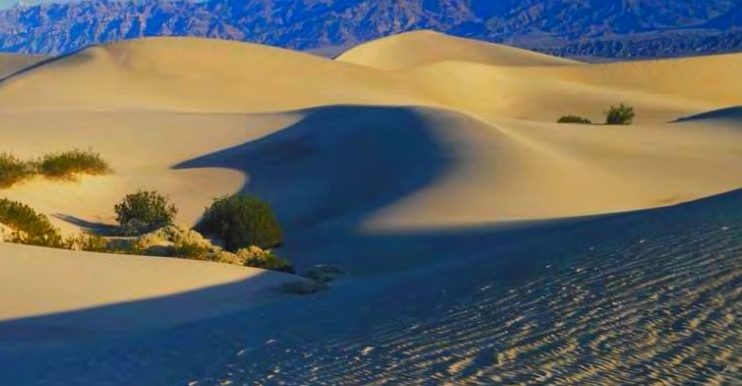 Many deserts get less than half that amount of rain yearly, and some receive almost none. Regions with an average annual precipitation between some 10 and 16 inches (25 and 40 centimeters) are often called semideserts. But rainfall is not the only factor that influences how much water is available to support plants. The distribution of the rainfall throughout the year, the humidity of the air, and the temperature and amount of sunshine all play a role. Some definitions of deserts focus on the imbalance between the amount of precipitation received and the amount of moisture that could be lost through evaporation and through plants' leaves. In the Sonoran Desert, in the southwestern United States and Mexico, for example, a year's potential evaporation-the amount of evaporation that would occur if water were always present-is some 100 inches (250 centimeters). This is about 20 times the actual annual rainfall. Rainfall in deserts is not only scanty but also erratic. Most deserts have at least a few days of rain a year, but some may get no rain at all for several years or receive a year's amount in one storm. For example, Iquique, in northern Chile, had no rain for a period of four years. The fifth year brought 0.6 inches (1.5 centimeters), making a five-year average of 0.12 inches (0.3 centimeter). At another time 2.5 inches (6.4 centimeters) fell in a single shower. Few parts of the desert are entirely barren. Where water seeps toward the surface, a great variety of plants spring up. After a rain low shrubs and grasses come to life. At blooming time, the plants are fragrant and bright with color. They grow quite far apart, instead of providing complete ground cover. Trees and large shrubs can be found in the desert, but they are not prominent in the driest regions. Desert plants differ in the ways they are adapted to arid places. Some plants sprout when the rain falls, bloom quickly, ripen their seed in a few days, then wither and die. Other plants survive periods of water shortage by drying up and becoming physiologically inactive. When more water becomes available they swell up and resume activity. Some desert plants depend upon underground water and have long root systems, while others are able to absorb dew. Various adaptations of the leaves, such as smaller surface areas, help prevent the loss of moisture. In most species of cactus, for example, leaves are either absent or very small. Cacti and other succulent plants also store water in their thick, fleshy tissues to help them survive long dry periods. Animals live in all but the most barren stretches. The camel is the most useful domestic desert animal. Its physical structure permits it to travel far without water. Various wild mammals, birds, and reptiles of arid regions must get all their moisture from their food. In times of drought, many desert animals remain inactive for long periods. Others hide from the sun during the hottest daytime hours and come out at night to feed. More than half of desert animals live at least part of the time underground, where it is cooler and more humid. Another strategy is migration: many birds and other desert animals survive by regularly moving to areas that have recently received rain.